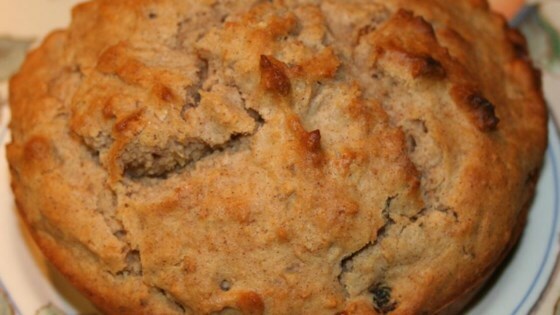 "My daughter adapted this recipe from multiple standard muffin recipes. I prefer these delicious muffins because they come out light and moist every time." Preheat oven to 400 degrees F (200 degrees C). Line muffin cups with paper liners. Mix rice flour, sugar, oat flour, all-purpose flour, baking powder, and cinnamon together in a large bowl. Beat egg, milk, vegetable oil, yogurt, and vanilla together in a separate bowl until smooth; add to the dry ingredients and mix by hand until mostly smooth with only small lumps and you cannot see any patches of dry material in the batter. Gently stir walnuts, raisins, and pumpkin puree into the batter; spoon into prepared muffin cups to about 2/3 full. Bake in the preheated oven until a toothpick inserted into the center comes out clean, about 20 minutes. Cornmeal, millet, and rice flours create a light, fluffy cornbread. Sweetened dried cranberries can replace the raisins, and you can also try another pureed winter squash in place of the pumpkin. Replace egg with 1/3 cup egg substitute if desired. texture was good, but the flavor was poor. I will not be making this again!